do i look like i have 4-5 pairs of hands??! Due in 2 days again?!!? This isn’t the 1st time my boss told me that Shanghai is due in 2 days! Previous cycle and the cycle before too!!! WTF seriously??! If I don’t deliver, management will deem that I am incompetent… if I deliver, management will maybe see and know that I do my best for my job… BIG LOAD OF BULL!! It’s proven the more I give in to this unreasonable timeline, the more they take for granted! We’ll see who has the last laugh… we’ll see. I feel angry for ya.. but the image you posted made me wanna laugh…. 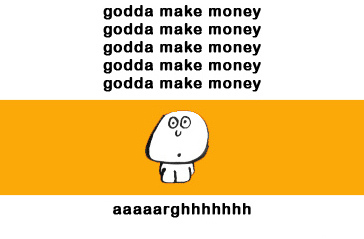 The Godda Make Money with your chanting OM… moment can be so.. ironic! ANGRY DAOOOOOOOOOO super buay tahan…. everything 2 days 2 days 2 days! kaoz… if give me $5k a month, u want 24hrs i also give ah!!! u mean that kinda f**kup face isit? LOL i know u miss seeing it lah… i take photo mms u? ?